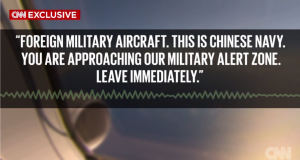 – China’s Foreign Ministry spokesman says U.S. actions in the South China Sea “‘irresponsible, dangerous” and that China’s military drove away the U.S. military aircraft. 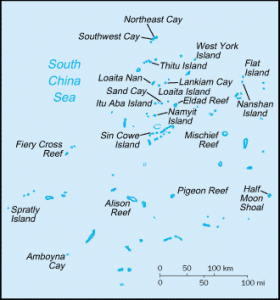 Last week the Wall Street Journal reported that the United States was considering sending U.S. air and naval assets to conduct freedom of navigation (FoN) transits around China’s artificial islands in the South China Sea, specifically the Spratlys – claimed in part or in whole by six nations. 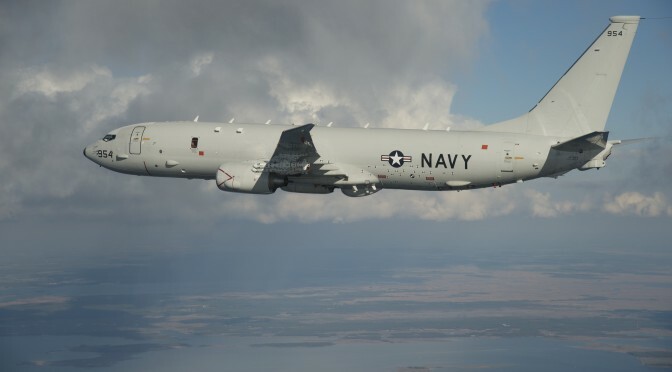 Today, CNN released exclusive footage from just such a flight, as a P-8 may have flown within the claimed 12nm of territorial airspace of three of the islands (more on that below), including Fiery Cross Reef and Mischief Reef. I highly recommend watching the video to gain a greater appreciation of the sort of interaction that is likely to occur with increasing regularity, and to see the dredging in action that CSIS’ Asia Maritime Transparency Initiative has so ably documented through overhead satellite imagery [full disclosure: I’ve contributed to the site in the past]. 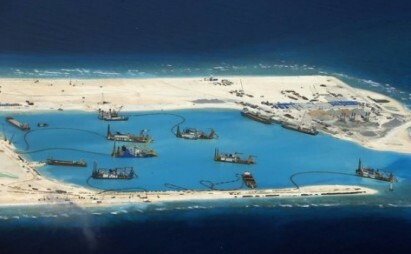 One of the questions bedeviling the maritime security community over the past several years has been how to respond to China’s “salami slicing” actions – a question that took on new urgency with the previous year’s massive surge in reclamation efforts in the South China Sea. Among others, the Center for a New American Security (CNAS)’s excellent Maritime Strategy Series included several reports devoted to developing options to provide answers for policy makers. Unfortunately, much of the analysis more broadly has struggled to move from generalities of the need to “impose costs” or, conversely, to “develop cooperative strategies” to the specifics of application. And, for those that did, there had until now been little evidence of words being translated into action. Not everyone is happy. Over at our partners’ site – ASPI’s The Strategist – Sam Bateman questions whether the “US knows what it’s doing” and rightly points out that FoN operations have to be “conducted with ‘due regard’ to the rights of coastal States.” But he also asserts that U.S. action is an indication that the United States has “taken a position on the sovereignty of the claims.” If true, (and that’s not official policy) it belies the first qualm since the United States presumably would not therefore need to take claimed but invalid rights into account. Bateman is on stronger ground in noting that if the Navy is sailing through the territorial waters or flying through the islands’ territorial airspace (it is not clear in the video whether this is the case) – water/airspace granted due to the small fractions of at least Fiery Cross Reef’s natural features that remain above water during high tide – it would do so at risk of violating the “innocent” condition of innocent passage if the vessels were conducting military missions such as intelligence gathering. This is not the case if the island is entirely man-made, if a military vessel refrained from action prejudicial to the coastal state, or if the vessel stayed in an island’s EEZ – outside the 12nm of the territorial waters. Of course this is all moot if, as Bateman suggests, the United States by these actions is declaring it holds specific island sovereignty claims invalid, rather than waiting any longer for China to explain upon what basis its claims are made. Perhaps the best course of action is for the United States to declare that until China has explained the basis for the nine-dash line claim in a manner in accordance with international law and so adjudicated it will not honor any of China’s South China Seas sovereignty claims or the rights derived thereof. This would cut through some of the legal complexity in providing a basis for the ongoing FoN activities and point to a way for China to take action to resolve the situation. While it is unlikely China will be persuaded to prematurely end its reclamation efforts, the actions undertaken by the Navy may at least demonstrate the likelihood that a declared South China Sea Air Defense Identification Zone (ADIZ) without resolution of outstanding claims will result in a frequent high-profile acts of indifference. Scott Cheney-Peters is a surface warfare officer in the U.S. Navy Reserve and founder and president of the Center for International Maritime Security (CIMSEC). He is a graduate of Georgetown University and the U.S. Naval War College, a member of the Truman National Security Project, and a CNAS Next-Generation National Security Fellow. Previous PostChina’s Naval Modernization: Implications for U.S. Navy CapabilitiesNext PostThe Royal Thai Navy: Where to Post-Coup? Too late. They already destroyed the reefs, raped the marine life and created the man made islands with buildings. I agree that the US needs to wait on the legality status of the claims made by China, but if China does not want to recognize international laws on making sovereignty claims, the US will still be viewed (to the Chinese) as the aggressors imposing their own will on the Chinese. I suspect the US along with the neighboring Asian nations will eventually either have to comply/recognize these claims or increase their naval presence in the South China Sea to send a message of disapproval. It still does not appear that the Chinese are interested in withdrawing, negotiating, or compromising their 9-dash line claims; blessings from the international community or not. The international community cannot assume or even expect the Chinese to comply with international norms, the benefits to the Chinese in following the international norms will most likely mean that they will risk losing possession of its claims in the South China Sea. On a positive note, the PLAN have recently made progress with participating and signing on CUES. It is a great step towards forming a framework of communicating its intentions along with understanding the concerns of the international naval community. But it does not seem to be convincing enough as to influence the decision-making with the buildup of artificial islands with the recent reaction by PLAN personnel to the P-8 flyover. 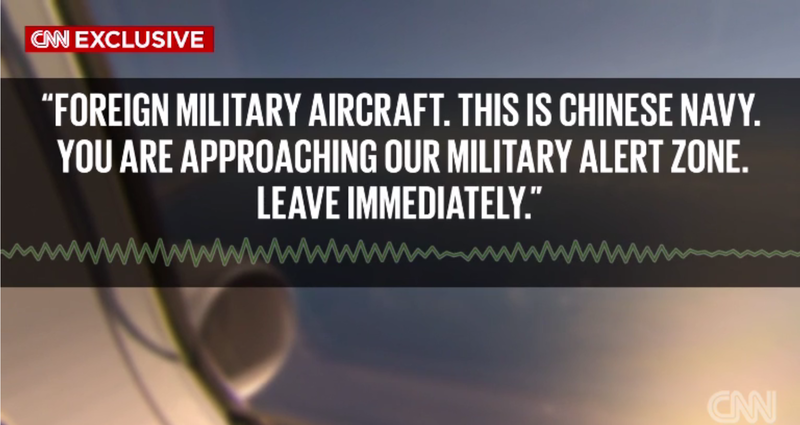 It seems obvious the Chinese are still suspicious of US Navy intentions (cue Hainan collision incident) if they are still calling challenges even when signing/agreeing to CUES. There is still more work to do to build that trust.